Chef Caleb Lentchner of the Marsha Brown Creole Kitchen and Lounge provides a taste of Big Easy in New Hope in Bucks County, Pennsylvania with his recipe for Seafood Court Bouillon - Creole Style Bouillabaisse. Laissez les bon temps roulez! 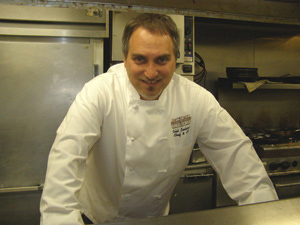 I met Chef Caleb Lentchner in early April 2010 while having dinner at the Marsha Brown Creole Kitchen and Lounge, where he is also the General Manager. 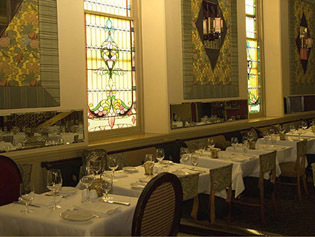 This Johnson & Wales culinary arts graduate has honed his career working at top hotels, and no matter how elaborate they might have been architecturally speaking, working at Marsha Brown Creole Kitchen and Lounge is probably the most unusual, as it was a former church where gorgeous stained glass windows add the perfect ambient spice to complement the Creole cuisine. At Marsha Brown Creole Kitchen and Lounge, this native New Yorker has the opportunity to uphold the tradition of Louisiana hospitality where many of the recipes on the menu have been handed down from Marsha Brown's family, yes, there is indeed a Marsha Brown, as well as to create his own Creole traditions with his recipes. Chef Caleb Lentchner graciously shares his recipe for Seafood Court Bouillon - Creole Style Bouillabaisse, which features a lovely mélange of lobster, salmon, redfish, scallops, crawfish, and mussels deliciously paired with onions, scallions, green pepper, garlic, tomatoes, spices, that are enhanced with red wine and clam juice. Method: In a large heavy saucepan, heat oil over medium heat. Add the garlic and vegetables and cook for 5 minutes. Add the green pepper, celery, and scallions and cook, stirring frequently for 5 minutes, or until softened. Use the side of a spoon to break up the tomatoes. Stir in the lemon juice, bay leaves, cayenne pepper, and thyme. Season to taste with salt and black pepper. Reduce the heat to low and cook, partially covered, for 25 - 30 minutes or until the sauce has thickened. Add the lobster meat, salmon fillets, redfish fillets, scallops, crawfish, and mussels in the sauce and cook, covered, over low heat for 10 - 15 minutes, or until the fish is opaque and flaky. Garnish with micro greens. Marsha Brown Creole Kitchen and Lounge is open for Dinner Monday through Thursday from 5:00 pm until 10:00 pm, Friday from 5:00 pm until 11:00 pm, Saturday from 4:30 pm until 11:00 pm, and Sunday from 4:30 pm until 9:30 pm. Read about Marsha Brown Creole Kitchen and Lounge in the Restaurants section. Read about Bucks County in the Destinations, Restaurants, and Chefs' Recipes sections. For information on Bucks County, please visit the website: www.VisitBucksCounty.com. © April 2010. Luxury Experience. www.LuxuryExperience.com. All rights reserved.